In 2015, the Department of Defense (DoD) released the DoD Cyber Strategy which explicitly calls for a comprehensive strategy to provide credible deterrence in cyberspace against threats from key state and nonstate actors. To be effective, such activities must be coordinated with ongoing deterrence efforts in the physical realm, especially those of near-peers impacting critical global regions such as China in the Asia-Pacific region and Russia in Europe. It is important for the U.S. Army to identify and plan for any unique roles that they may provide to these endeavors. This study explores the evolving concept of deterrence in cyberspace in three major areas: • First, the monograph addresses the question: What is the current U.S. deterrence posture for cyberspace? 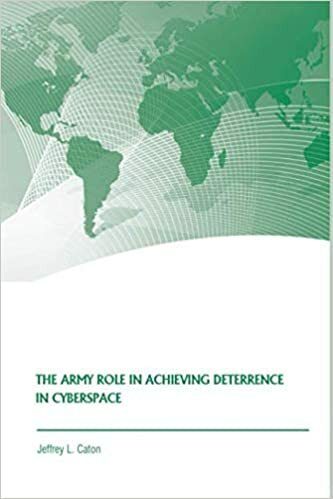 The discussion includes an assessment of relevant current national and DoD policies and concepts as well as an examination of key issues for cyber deterrence found in professional literature.• Second, it examines the question: What are the Army’s roles in cyberspace deterrence? This section provides background information on how Army cyber forces operate and examines the potential contributions of these forces to the deterrence efforts in cyberspace as well as in the broader context of strategic deterrence. The section also addresses how the priority of these contributions may change with escalating levels of conflict.• Third, the monograph provides recommendations for changing or adapting the DoD and Army responsibilities to better define and implement the evolving concepts and actions supporting deterrence in the dynamic domain of cyberspace.